This is the time for retrospection, reflection and resolutions, unless of course you are fixed on dry cleaning for that perfect midnight bash. The year 2016 is just around the corner and we are going to get a fresh 31,622,400 seconds – 2016 being a leap year, we are going to get an additional 86400 seconds –to work, play and live. I just hope that someone is not going to moan about the fact of having to work an extra day for the same salary. From a Sri Lankan point of view, assuming that we are using our mental and analytical faculties, it should be evident that 2016 is going to be quite challenging. We stated that the Budget is an opportunity to set the stage for the future. We also commended the Budget for all its enlightened proposals for an innovation economy. Though most of these proposals did not meet the eye of the fellow politicians, media, and even those within the industry, what did receive attention meant many a proposal have taken a u-turn. Reaction may be claimed to represent the flexibility and the acceptance of the power of reasoning. Yet one wonders, if we are used to scenario planning and an in-depth analysis, whether we would be facing this type of situation. Some, indeed today, seek pre-mortem knowing very well with post-mortems the damage had already taken place. Thus, the emphasis on placing your thinking hats on well in advance. Think before you jump! These u-turns may further complicate the future as the dynamics of the Budget has turned into a giver’s circus. With political ideologies, which basically embrace the short term goals, the concept of future which considers planning horizons of decades and more are just illusionary. The good governance and transparency may require changes that are definitely not popular. What is right is usually never popular and this is very much applicable to our situation. At the end of a year, we are passing through a date where there should be more than the usual way of looking forward to the next day. How are we to address the emerging issues about most of which we are sure to admit we know very little about? Yet the national resilience will come through the preparations that one takes on, provided that enough personnel are mobilised with the right mindset for change and growth. It is that personal mission that one may need to take a relook at. 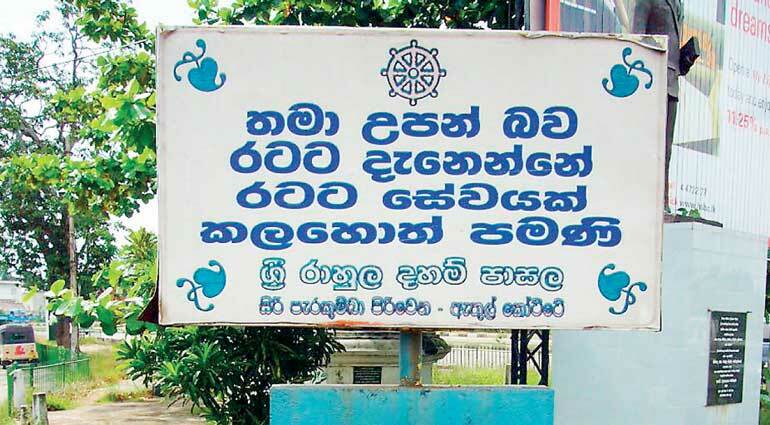 A message board at the Athul Kotte junction, which appeared to have evaded the transformation process, caught my eye; and the message was striking. The message is simple yet quite powerful. If you do not contribute to the society that nurtured you then the land that nurtured you really would not know you existed. This is a powerful statement requesting all of us to recalibrate our way of living and especially working. The statement is an eye opener to those who live within and also those who may have departed, for various reasons, having benefitted from the resources. How should we be working and how should we be helping? This is also a month where we observe lot of expatriates visiting the country, moving to enjoy perhaps a couple of weeks in the land that they left behind in search of different dreams. There are a lot of ways that the Diaspora can help. We do have many national examples of active Diaspora in shaping economic progress – Israel, Korea and now even India. It is important to understand that the way to support is not just waving the flag, drink the local brew and sing popular old time lyrics. This type of private amusement will be just that – private amusement. It may result in an unclear head but certainly there would not be anything tangible to the land of birth. We need the Diaspora to be more imaginative in their way of support. Donations to get rid of that feeling of guilt too are insufficient. Yes, to the needy this is important, but what is needed is the type of inputs to ensure a more sustainable future. The issue is what the nation has lost, which is really important human capital and the mere transfer of some funds is not compensation. The future that is emerging will be full of challenges. On the other hand many an exciting developments too are taking place. We cannot be part of a community who are to be mere recipients of such advances. To make the future really a common future we should also have a stake in advances that shape the future. Expecting the Government to respond to each and every call for subsidies, concessions are faulty – in fact continuous clamouring for more and more benefits is really an act of shame. We need to transform the growing up generation to be more responsible and accountable too. Having passed the gen X, Y etc. we are encountering the Millennials. What we are observing with them is more of the ‘me and me’ mindset. There is the tendency to spend more time taking selfies than being selfless. More concern about style than substance. Such a mindset is an issue in moulding a flourishing society. If the past has taught us anything and if the advances that we take for granted tell us anything through their inner stories, it is that perseverance and persistence are necessary ingredients. Few who have had the courage and such attributes did contribute in many ways. We just cannot imagine that the future will be any different. If I only believe in leisure and lack the commitment to risk and venture, our advances would be hard to come by. In fact, it is almost certain that nothing would happen. Our behaviour demonstrated is not one of commitment. Think again when another pound of flesh is requested. Like the new sustainability goals, where one is eradicating poverty by 2030, we too should be having goals of substance: No more dependence on remittances from abroad which is earned through sweat and discomfort, no more need for Samurdhi, doing away with permits, no more need for free clothing, books etc., no more need for big functions when the substance of the event is to distribute free goodies. Removing all social welfare is not the idea but when the country as a whole behaves only as a welfare State, the meaningful growth is a dream. Such transformations are only made possible with the resolute resolution of making the economy strong and really strong. This demands a definite mindset change plus the way we do things. Showing Yoda Ella to visitors and charging them at dollar rates will not bring any respite one needs to create ‘Yoda Ella’s of today’ to transform the landscape. Note that in the same area today we are desperately seeking ways to provide clean drinking water to some affected communities while we believe that ensuring a drinking water supply through a connected mechanism to be a time consuming, difficult if not an impossible task. Our ancestors who perfected hydraulic systems may be turning in their graves. We do not set goals of clean water by 2018, ensuring tap water is always safer to drink. We think of buying and installing incompatible systems across the landscape and perpetually becoming dependent on an external supply chain that is sure to add another strain due to the dollar demand. Why these were mentioned is because the New Year time is the time for resolutions and it is my view that thinking about the next vehicle model as a New Year’s resolution is not going to be useful. There is the need for the emergence of Edison equivalents and the change of the ecosystem to ensure that they do indeed find fertile environs to risk, fail yet succeed and subsequently deliver. Such deliveries are the ones that will take our conventional development trajectory to a new position. Seeing the stresses possible in 2016, every second may count. We need to understand first and foremost to shift from inefficient systems to efficient pathways i.e. from current grid inefficiencies and poor people productivities. Pouring additional resources to an existing inefficient system is not going to do any good and that is what we, most of the time, have been dutifully doing. Hence a set of measures and activities should be in bringing in an efficient organised way of doing things. The media will have to play its role well. The usual filling of the airways with less than useless material simply because that is what the society asks for, not only demeans the society, it is an outright demonstration of irresponsibility. It is important to be a member of the society in a meaningful way. Do not think for a minute, because of what Sri Lanka is today, that it cannot be what we, as responsible citizens, aspire and imagine it to be. Make the resolutions to be different and cling with passion and get more passengers on board. While Teslas and Edisons are required, we should not forget the wisdom of Margaret Mead with one change – Never believe that a few caring people can’t change the nation. For, indeed, that’s all who ever have.